The historian Eutropius (fl. 4th century) is best known for his ten-book collection detailing the history of Rome from its start through to the death of the emperor Jovian in 364 AD. Besides writing a concise history, he also served in government, advancing to some of the highest offices in the State, under several different Roman emperors. Not much has been written about the early life of Eutropius. There is even disagreement concerning his origins. Some historians credit him as a native of Burdigala (Bordeaux) in Gaul, where others say he was of Italian origin. Regardless of his origin, it appears that Eutropius enjoyed the benefit of a rhetorical or sophistic education. This would prove beneficial for his later work, Breviarium ab Urbe Condita, a sweeping yet detailed survey of Roman history. Eutropius held several public offices during his career, many of them illustrious and powerful. These gave him the opportunity to observe the character of the emperors. He became secretary to Constantinius II, who ruled over Asia Minor, Syria, and Egypt after the empire was divided in 337 AD. When Constantinius died in 361 AD, his cousin Julian succeeded him and allowed Eutropius to retain his position. Julian had been given an education that combined Christian and Neoplatonic ideals. He became an able leader and successful combatant. Although he eventually abandoned Christianity, Julian issued edicts of religious toleration while making an unsuccessful attempt to reinstate paganism. His short reign [361-363] was just, and he was responsible for far-reaching legislation. Eutropius accompanied Julian on his Persian expedition, where the emperor was killed. These experiences all helped to shape Eutropius' standards for a good emperor. He would write about these ideas in his later epic history. Shortly after Julian was killed, Eutropius served under the eastern emperor Valens. Over the next several years, he held many different and very important offices. In 369 AD, Eutropius was named secretary of petitions ( magister memoriae ). From 371 until 372 AD, he was proconsul of Asia. In 379 AD, Eutropius visited the court of Gratian, Roman emperor of the west who ruled Britain, Gaul, and Spain. He was a successful warrior against the barbarians and worked against paganism. Soon after his stay with Gratian, Eutropius became the prefect, a chief officer or magistrate, in Illyricum, where he stayed from 380 until 381 AD. He was named a consul in 387 AD, as the colleague of Valentinian II, Gratian's brother. It was through these personal experiences and competent observation that he was able to write such a complete history of Rome. Historians have dated Eutropius' Breviarium ab Urbe Condita to approximately 370 AD. He was serving under the emperor Valens, who commissioned the work. The books are dedicated to this ruler of the Eastern Empire. They presented a survey of the story of Rome in ten short books. According to Michael Grant, author of Greek and Latin Authors, "Starting with the legendary origins of the city under Romulus, the work reached the Civil War between Sulla and the Marians by the end of Book 5 and described the death of Julius Ceasar in Book 6. Books 7-10 cover the entire period of the emperors down to the death of Jovian (364)." There are many opinions on the worthiness and artfulness of the history, but there is little doubt of its inclusiveness. In Harper's Dictionary of Classical Literature and Antiquities the author opined that "it is a brief and dry outline, without either elegance or ornament, yet containing certain facts which are nowhere else mentioned." It is through these books that we are given a light into the character of Eutropius, perhaps better than any other historian or biographer could have captured. Eutropius has been credited with writing a history that is commendably impartial, perhaps very difficult to accomplish by one who had served in so many different offices. Nevertheless, when summing up the accomplishments of rulers his opinions were fair. The attention Eutropius paid to the qualities and characters of the emperors reveal his own principles. In the last sections of Breviarium ab Urbe Condita, Eutropius was able to bring to bear his own personal knowledge and experience of events. We are able to discover his own moral character through the treatment of his subjects. H.W. Bird, in his article Roman Emperors: Eutropius' Perspective, states that "Eutropius does not appear to have been overly preoccupied with the cultural attainments of the emperors. Moral qualities and imperial competence were much more important to him than education and cultural abilities." In the tradition of Seutonius and Pliny, two major contributors to Roman history, Eutropius judged emperors according to certain standards and ethical behavior. Were they civil or conceited, opulent or lecherous, merciful or cruel? But even as he was fair in his account of history and the Roman rulers, his opinions do become apparent to the careful reader. As Bird states, "He plainly loathed cruelty, excessive severity, greed and ingratitude. He did [however] admire military ability, efficient administration, moderation, liberality and civility." Eutropius kept his work clear and wrote with an unpretentious style, hoping to influence the emperor Valens. Bird contends that Eutropius' motivation for writing the history was, in part, to spur Valens on to achieve the greatness that had been demonstrated by earlier emperors. Eutropius wrote a scathing yet honest report of Nero, who ruled from 54-68 AD. He also gave negative accounts of Tiberius and Caligula for their excessive cruelty and greed. In dealing with the first century rulers, Eutropius repeatedly reported that "good" emperors maintained cordial relations with members of their Senate. While recording the story of Rome and its rulers, Eutropius magnified the qualities of reputable character. It is possible that he was, at least in part, protecting his own official interests, but that was not his main motivation. His character dictated moral behavior and fair treatment of the Senate. There is no other individual found in the Breviarium who is more extensively recorded and esteemed than the emperor Trajan, who ruled from 98 to 117 AD. Eutropius obviously held Trajan in high regard, and went to exceptional lengths to portray him as a model for Valens. Bird believed that Eutropius had a two-pronged motivation for comparing Trajan with Valens: military and domestic. Eutropius pushed for an aggressive eastern policy and used the glory of Trajan to emphasize his point. 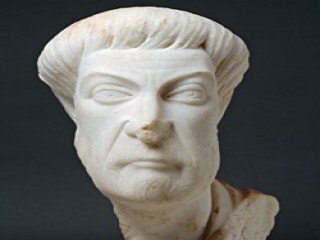 In domestic matters, Eutropius likens civility with an emperor's Senate to prominent military battles; each are important and one need not preclude the other. These were paramount issues in the Roman empire. In Book 10 of Breviarium ab Urbe Condita Eutropius wrote a radiant eulogy of the emperor Julian, a ruler he greatly admired. "He possessed a great and ready eloquence and a most tenacious memory and was in some respects more like a philosopher. To the provincial peoples he was most just and he lowered the taxes as far as was possible. He was civil to all, only moderately concerned for the treasury, but he was eager for glory and through that for the most part he demonstrated too much courage. He was an excessive persecutor of the Christian religion, yet in such a way that he abstained from bloodshed, and not unlike Marcus Aurelius, whom he even strove to emulate." These words reveal what Eutropius looked for in a great ruler of the Roman Empire, and perhaps hoped that Valens would become. He hinted at lowered taxes, civility, and refraining from bloody persecutions—advice that any leader would do well to take. These arguments would be taken to heart by many subsequent rulers. Eutropius' writing style, along with his practical summary, ensured the popularity of Breviarium ab Urbe Condita from the onset. It was translated into Greek by Paenanius around 380 AD and was adapted in the same language by Capito of Lycia, in the sixth century. Others drew on his work to either supplement their own histories or for other uses. Grant affirmed that "in the eighth century [the history] served the Lombard historian Paul the Deacon as the basis for his much longer Historia Miscella." Breviarium ab Urbe Condita has been translated into Spanish and English and is still used today by many students as an introduction to Latin prose. At the close of the work, Eutropius announced his intent of continuing the narrative in a more elevated style, but was never able to carry out this plan. Still, his history has survived through the translations of others and is still studied today. View the full website biography of Eutropius.